Take the first step in obtaining the American Health Information Management Association's (AHIMA) Certified Coding Associate (CCA) credential with the CCA Exam Review Guide, 2016 Edition. 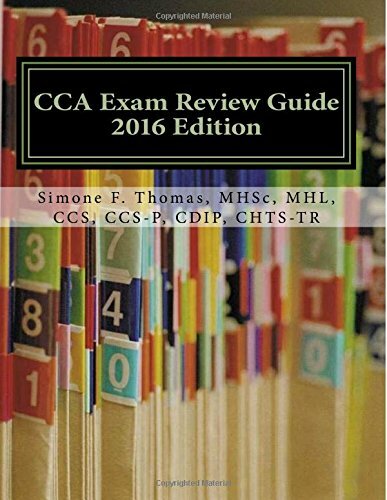 The CCA Exam Review Guide is designed to take the candidate through the items in each domain such as ICD-10-CM/PCS and CPT classification systems, reimbursement methodologies, health records and data content, compliance, information technology, and confidentiality & privacy. Multiple choice review questions for medical terminology, anatomy & physiology, and pathophysiology are also included. Develop hands-on skill and build confidence with fill-in-the blank, multiple choice, and case scenario practice questions. Enhance your coding skills by assigning diagnostic and procedure codes in both the inpatient and outpatient setting. Preparing for your CCA credential is just one book away. Simone F. Thomas, founder and president of Empire Healthcare Consulting, is a Medicare Risk Adjustment Analyst, college professor, and author who uses her unique experience to provide consultation in the areas of physician education, compliance, and clinical documentation improvement. She has lectured extensively on the subject of medical coding and is also the author of the CCA Exam Review Guide, 2012/2013/2014/2016 Edition and the Physician’s Pocketguide to Medicare Risk Adjustment Documentation, 2013 and 2016 Edition. Additionally, Simone is the recipient of the 2013 Florida Health Information Management Association (FHIMA) Mentor Award, the 2015 FHIMA Literary Award, and has been nominated for the 2013 Making Dreams Come True-Distinguished Educator Award from the American Health Information Management Association (AHIMA). Simone received a bachelor’s degree in Sports Medicine and a certificate in medical coding from Florida International University. She earned two master's degrees from Nova Southeastern University in Health Science with a concentration in Sports Medicine and in Health Law with a concentration in Compliance. Most recently, Simone earned a Health Information Technology for Economic and Clinical Health (HITECH) certificate from Broward College documenting her knowledge of EHR technology. Simone is a member of the American Health Information Management Association (AHIMA) and the Florida Health Information Management Association (FHIMA).